Doesn’t the sound of sizzling meat just make your mouth water? A few months back, we came back from Korea and I have been talking about Korean BBQ pork at least once a week. My quest for authentic Korean food has never stopped. Some restaurants in Singapore and Malaysia do not make the grade. I am not saying they are not good. 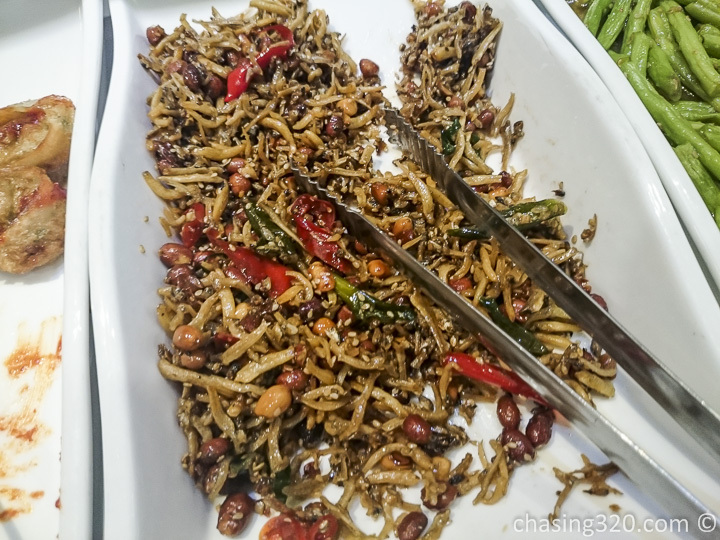 Most have done well to localize the flavor to make it Singaporean Korean or Malaysian Korean. But I was looking for the taste that will heal my Seoul. Of course, dining Korean is going to a bit more and with our large appetites, we usually chalk up a large bill. I am perfectly fine with chalking up a large bill but I always want the quality and value of the food to match what I am paying for. For example, playing RM40 for lousy baked beans, a toasted turkey ham sandwich and some orange juice for me is ridonkulous. 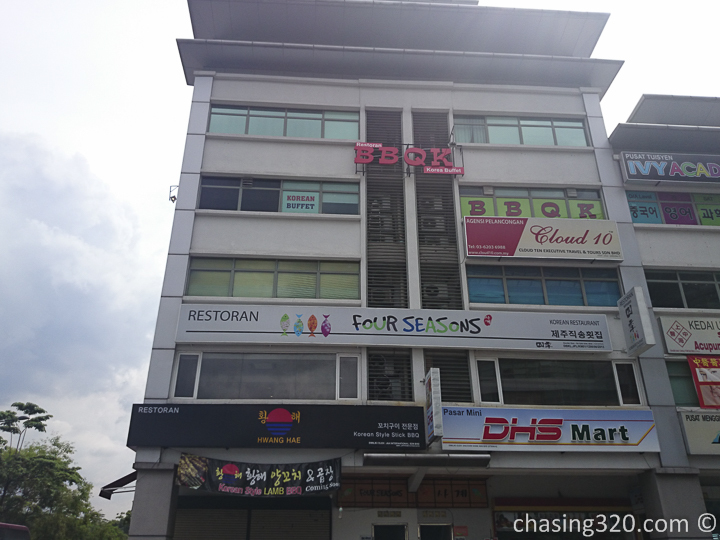 Scouring the land for Korean food that whacks a Korean flavor as well as giving value was tough. Queue BBQ K at Solaris Mont Kiara. 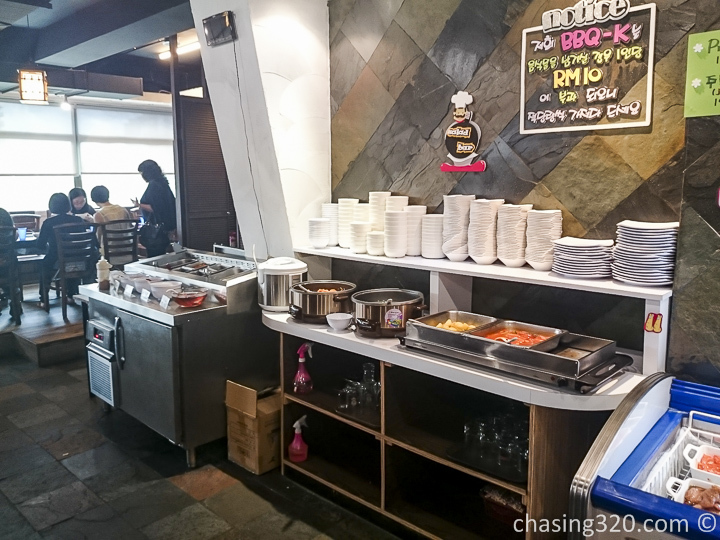 Nestled on a corner of Jln Solaris 2, this little gem is an eat all you can buffet. If you read other blogs, many posts of the need to call ahead for reservations and expect long lines. For a Saturday lunch time, I felt it was nothing to worry about but I did call ahead to let them know we were reserving seats. My target was basically pork and more pork. 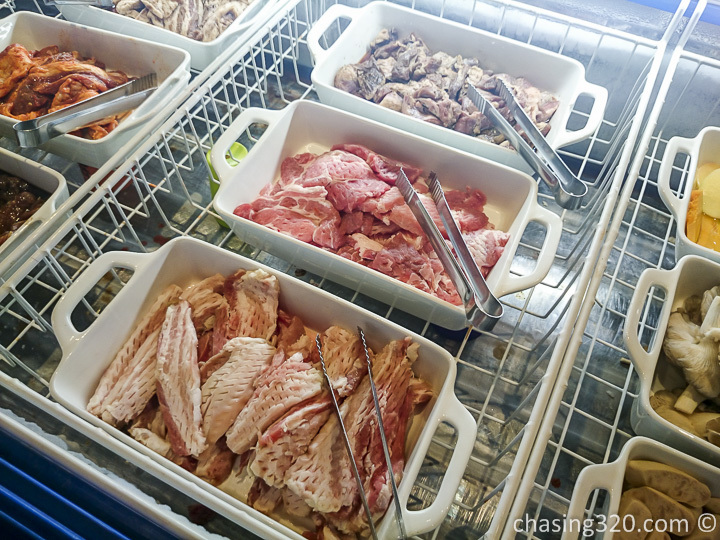 Two items mainly the thin slices pork belly (samgyeopsal) ; thick cut pork belly. It takes a while to set up what we wanted. The hotplate BBQ was heated up and after getting both cuts of meat and grabbing the garlic and sesame oil salt combo, it was time to cook. This is a pork lover’s heaven. 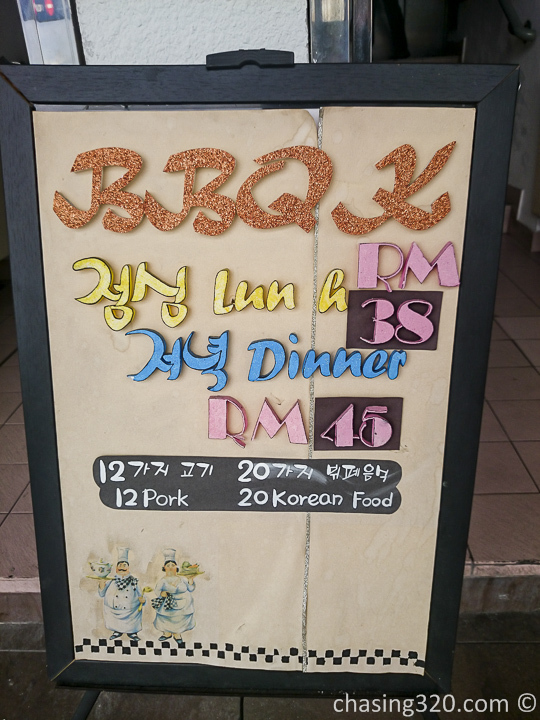 Having observed how Korean BBQ was cooked in Korea, I decided to let the staff know that I will do the barbecuing and to not worry about our table. The service however, is excellent and the staff are all eager to help. 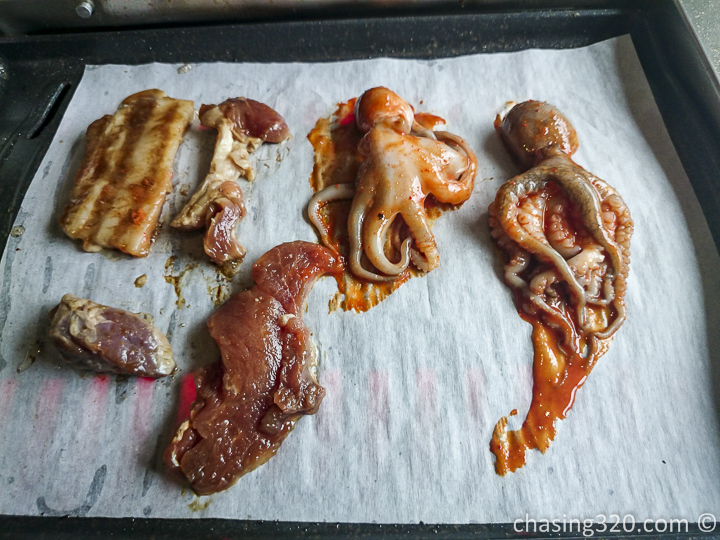 Firstly, place the slices of meat across and wait for it to start sizzling and cooking. Once the raw color starts to slowly disappear, flip it over to cook the other side. I like my meats medium to welldone so I may flip a bit earlier. Next, start cutting the strips to smaller portions to allow for ease of eating and of course, cook it a bit faster. At about 90% cooked, I usually start to take them off the pan and let them cool on a side plate. This is how I love to eat my Korean BBQ pork belly. Gireumjang (기름장), made with salt and sesame oil. Just do not put to much oil. I drained my oil after seeing the above faux pas. Then take a slice or two of garlic and make a wrap. Adding some rice is optional but I am not hitting any rice today. 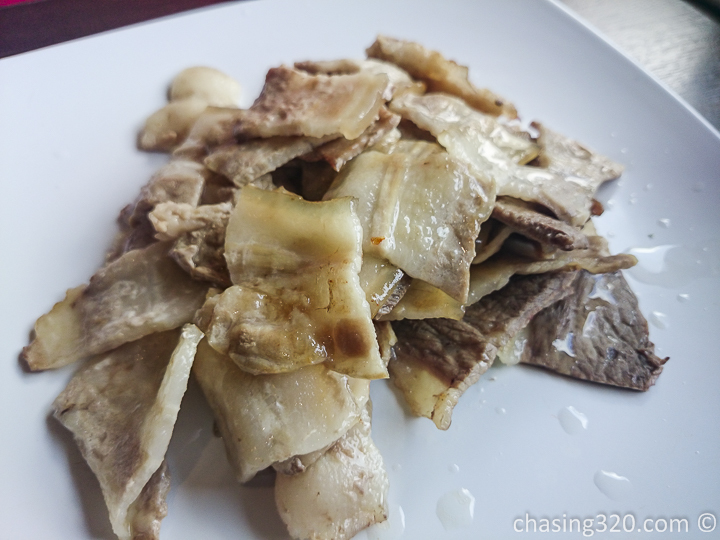 Shove this wrap down and enjoy the explosive burst of pork, pork oil, salt and garlic combo. Repeat. This is daebak!!! 맛있다!! For those who prefer the leaner pork, take the pink one. The white is, as you all know, pork fat. Over the course of about 2 hours, I consumed so much meat happily and made many trips back and forth. The chicken was not too bad. We did try the octopus but for us, the favorute was still going to be the pork. Watch the oil drip away. This appeases the senses for those who feel guilt. 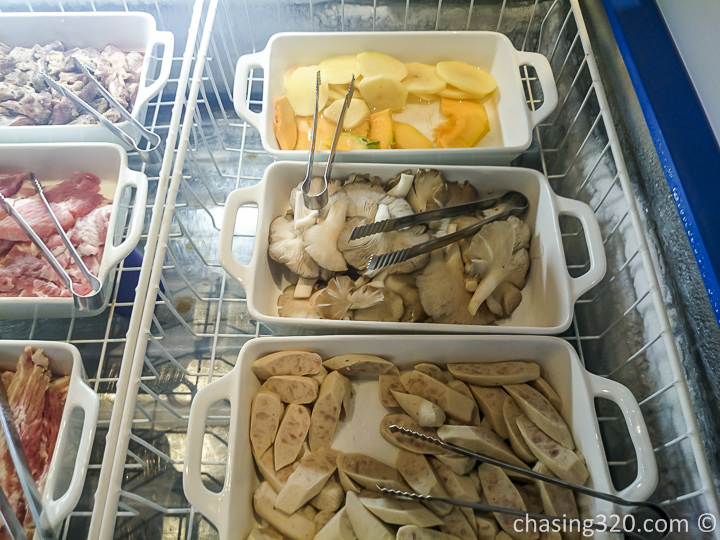 There are plenty of banchan around but honestly, just a sideshow. 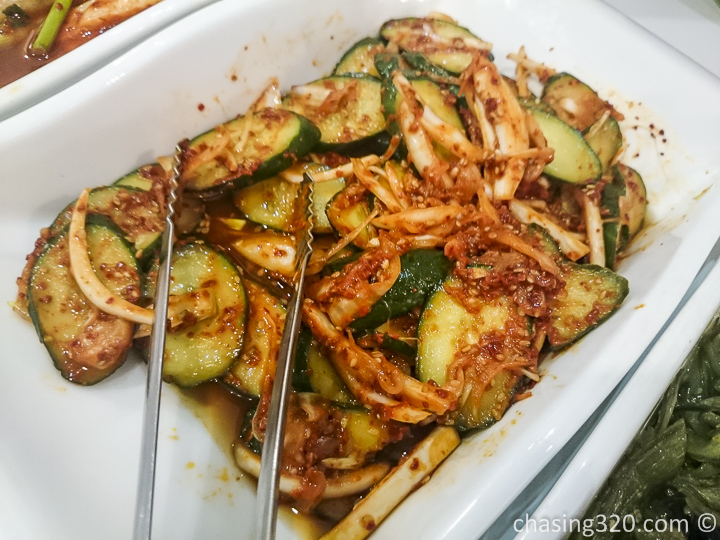 This is one of my favorite banchan but with pork on the line, I could not spend too much time on this. I can safely say that the craving for Korean BBQ Pork in Korea has been met. 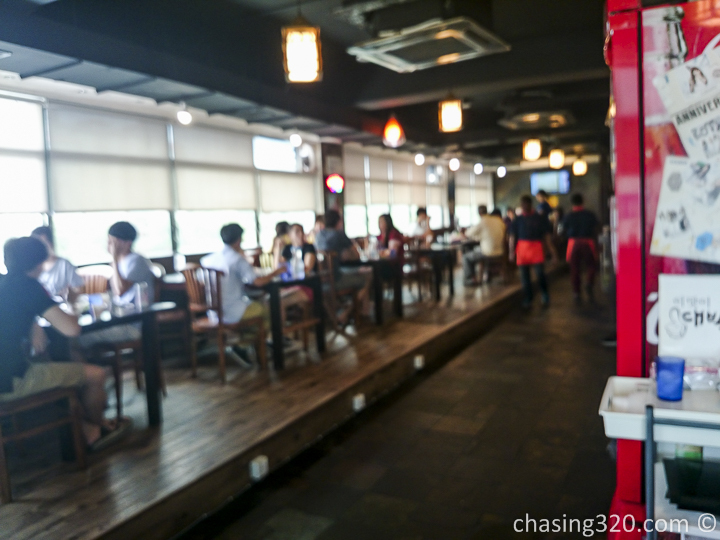 I will come here if my Seoul craves for a taste of Korea. Food is best when upon the moment of it hitting your palette, the flavors bring you back to memories past. That is why some people shed tears when they find a long lost taste. Some foods transport you back to your childhood, remember how your mother would cook a certain food. Some bring you back in time to that special memory during a trip you took. Our senses are powerful reminders and have the capability to bring us back in time to invoke beautiful memories. I totally feel this one brought me back 7 months, to Seoul. That was not just the surprise of the day. It was time for some desserts and we started with two slices of watermelon. As most know, watermelon is a tricky affair. Most of the watermelon bought in KL aren’t sweet but boy was I surprised. It then started a multiple trip multiple slice binge of watermelon. We cleared an entire row of some 30 slices! The young boss even gave us some ice cream and boom, this ice cream is creamy awesome. One of the best meals I have had. The past few weeks since my Taiwan trip has seen my appetite and taste bud crave for something enriching. A lot of good food did not make the grade and I was always disappointed. I was feeling as if my taste bud was changing or feeling the depression. This meal brought me hope. Perfect Seoul healing for me. Can I come back next weekend? Credit card payments for bills above RM150. Reservations may be required especially for weekend dinners. Please call ahead. Time limit is 2 hours.